E.C. Brassil, D.A. Piper, and J. Shedlock, Air Pollution Information Resources. D.F. Adams and S.O. Farwell, Sampling and Analysis. R.J. Bryan, Ambient Air Surveillance. D. Leith, J. Dirgo, and W.T. Davis, Control Devices--Centrifugal Force and Gravity; Filtration; and Dry Flue Gas Scrubbing. K.E. Noll, G.B. Nichols, J.W. Crowder, and S.M. Senkan, Control Devices--Electrostatic Precipitation; Scrubbing; Mist Elimination; Adsorption; and Combustion of Toxic and Hazardous Wastes. R.B. Engdahl, R.E. Barrett, and D.A. Trayser, Process Emissions and Their Control--Part I.
J. Berry, D. Beck, R. Crume, D. Crumpler, F. Dimmick, K.C. Hustvedt, W. Johnson, L. Keller, R. McDonald, D. Markwordt, M. Massoglia, D. Salman, S. Shedd, J.H.E. Stelling, III, G. Wilkins, and G. Wood, Process Emissions and Their Control--Part II. Index. Subjects extensively covered include asbestos, carbon dioxide, lead, nuclear accidents, non-ionizing radiation, stratospheric ozone, and visibility. 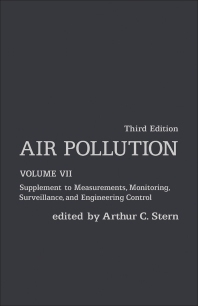 This state-of-the-art compilation will facilitate the work of air pollution control agency personnel, air pollution research scientists, and air pollution consultants. It will also be useful to law firms involved in air pollution litigation and to air pollution equipment and instrument manufacturers. University of North Carolina, Chapel Hill, U.S.A.